David Flitcroft in his shirt and jumper that saw him mistaken for security staff at Tesco. 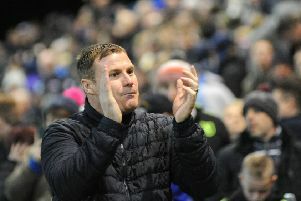 Mansfield Town manager David Flitcroft was mistaken for security at a supermarket — and stopped a potential shoplifter! 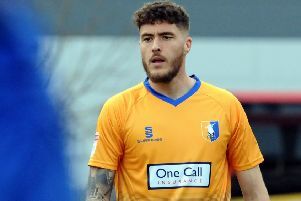 Flitcroft was on his way to Mansfield Magistrates’ Court for the case against Sheffield Wednesday’s Fernando Forestieri, who was found not guilty of racially abusing Stags defender Krystian Pearce at a friendly at One Call Stadium in July. Flitcroft, who stopped off at Tesco before going to the hearing to support his player, said: “It was a bit of an unusual day. It was a strange one really. “I first went to Tesco. It was the first time I had had a shirt and jumper on. “I thought I looked smart for the court. A lady was walking out with some shopping and she stopped and threw it on the floor. “She thought I was security — I’m going to have to change my attire or do something! “Then she put her basket down thinking I was security for Tesco and was going to stop her.